A coronary artery bypass graft (CABG) is a surgical procedure used to treat coronary heart disease as it improves blood flow to the heart. During the graft surgery, a blood vessel is taken from another part of the body (chest, leg or arm) and is attached to the coronary artery (above and below the narrowed area or blockage or plaque). The formation of a new blood vessel is known as grafting. 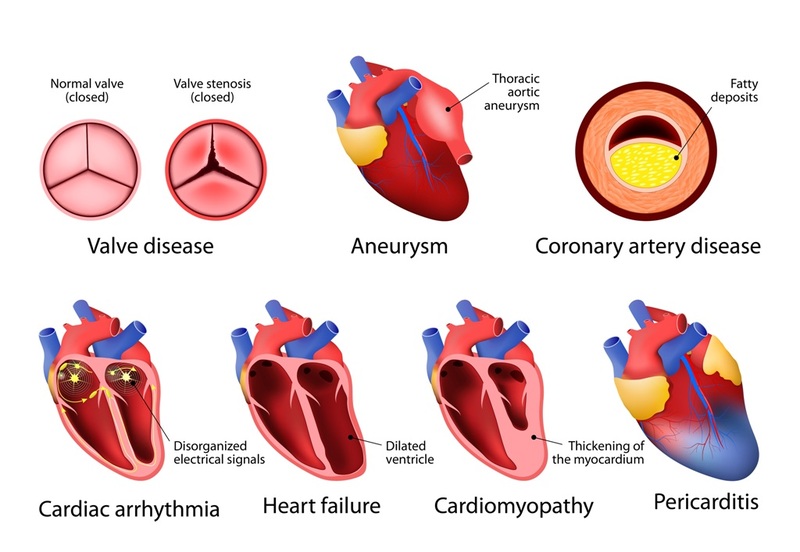 Coronary heart disease is detected through symptoms such as angina which usually leads to heart attacks. Angina pain is a severe chest pain which occurs when the blood flow to the heart is not sufficient. Angina is an indicator of heart diseases. If the disease is treated early, it may prevent a heart attack. 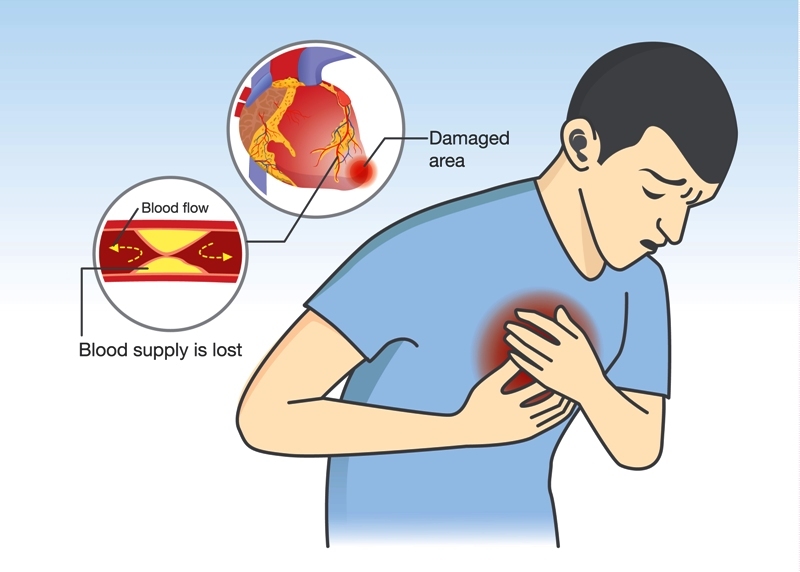 Common symptoms of angina in men are chest pain, pain or discomfort in upper body including arms, left shoulder, back, neck, jaw, or stomach, rapid or irregular heartbeat, stomach discomfort that feels like indigestion, shortness of breath, dizziness, breaking out in a cold sweat, etc. Chances of angina pain are higher in men as they are at greater risk of heart attack or heart diseases. Stents are expandable tubes, small in sizes which are used treat narrowed arteries. 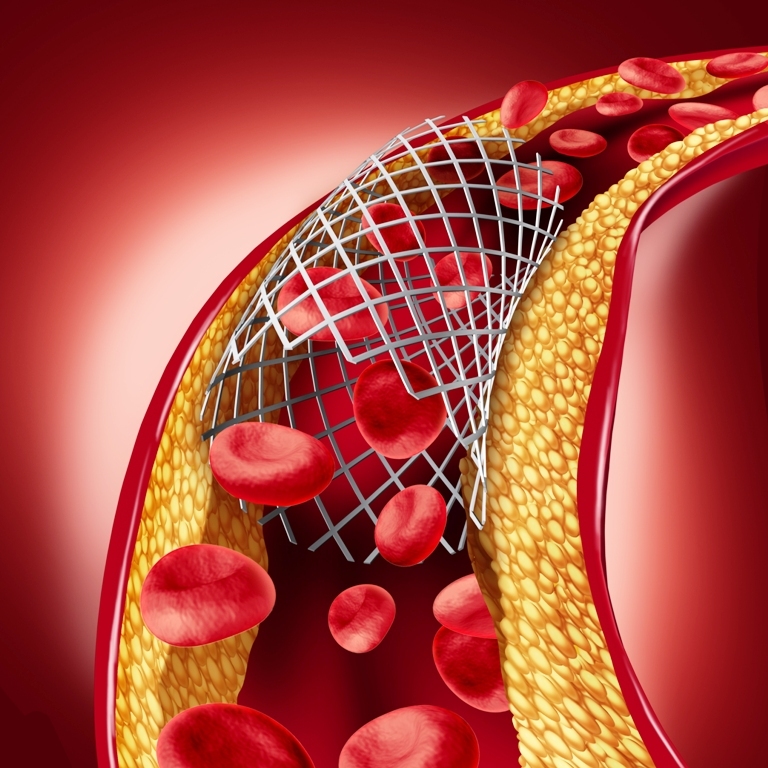 The concept of using a stent implant is to widen the arteries and reduce the risk of cardiac arrest. Stents made up of bare metals have low risk of arterial-collapsing. Biodegradable stent is absorbed by the body and disappears after it has done its work. After angina pain and detection of blockage in artery, doctors suggest stent angioplasty. It is a common procedure for correcting heart blockages. Angina or chest pain is caused by blockages in heart arteries. Main types of angina pain are chronic stable angina when the heart works hard and unstable angina is new chest pain or chest pain that is getting worse. Treatment for chronic angina is angioplasty. During angioplasty, a small balloon is placed in the narrowed artery by a catheter. 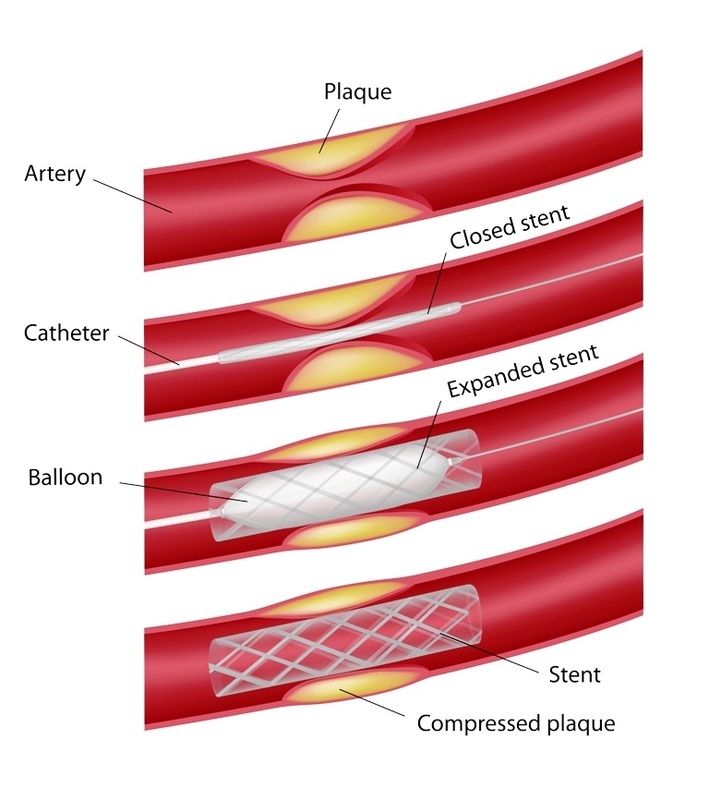 The balloon is inflated which widens the artery and a small metal wire-like tube (called stent) is placed to keep the artery open and allow proper blood flow. Chest pain is a very discomforting pain which can be felt anywhere from a person's neck to the upper part of the abdomen. Chest pain due to heart problems can be sharp and constant and causes a feel of squeezing, crushing, tearing (or ripping), etc. Reduced blood flow occurs due to artheroschlerosis. This may lead to the formation of blood clot which damages the artery walls and ultimately results in chest or angina pain. Angina is one of the main signs of heart attack. The image shows heart muscle damaged due to blood clot. 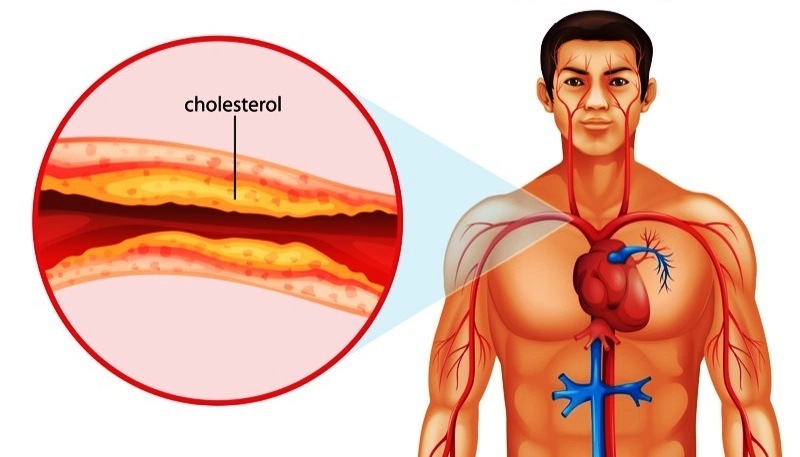 Atherosclerosis is a condition in which plaque builds up inside the arteries. Plaque comprises of fat, cholesterol, calcium, and other substances found in the blood. It hardens with time and tapers the arteries. Due to this, the flow of oxygen-rich blood is reduced to the organs and other parts of the body. 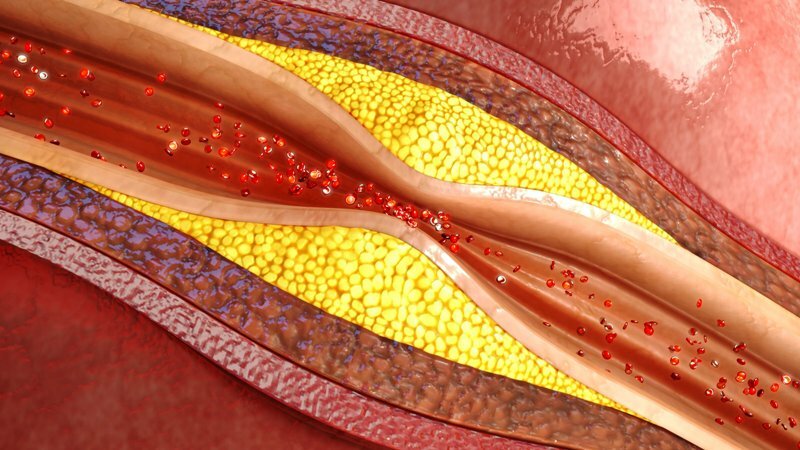 Atherosclerosis causes angina pain and then may lead to heart attack, stroke, or even death. Angina is not a disease, but is a symptom of heart diseases which occurs due to reduced oxygen in the blood reaching the heart. Reduced oxygen level is due to plaque formation (atherosclerosis) or damage to the arteries. 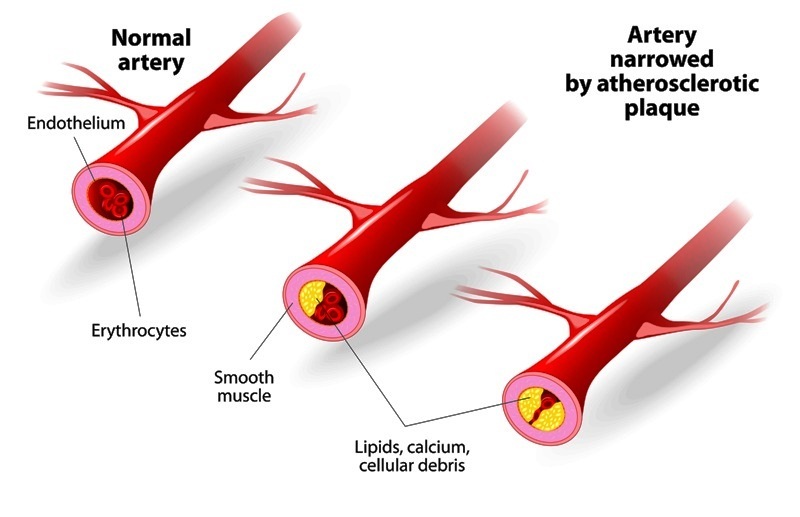 Atherosclerosis is the process in which cholesterol and calcium plaque accumulate within the arterial wall. The wall of the blood vessel thickens when plaque builds which narrows the channel within the artery and reduces blood flow. This reduces the amount of oxygen and other nutrients reaching the body. Endothelial cell injury leads to the formation of plaque which results in lipoprotein deposition. Lipoprotein molecules are modified by oxidation and are known as LDL, which attracts inflammatory cells. This results in formation of a “fatty streak” in the arterial wall. The smooth muscle cells migrate to the surface of the plaque and form a “fibrous cap” which ultimately leads to thrombosis. Plaque is a fatty, waxy substance that deposits in the artery wall and results in atheroschlerosis. Plaque narrows the artery and reduces the blood flow. Common causes of plaque are high cholesterol level, high blood pressure, smoking, diabetes, etc. The blocked artery and reduced blood flow leads to chest pain or angina. Angina is a foremost and major symptom of coronary artery disease. Blocked artery to heart or brain leads to a heart attack or stroke. If an artery which is supposed to supply oxygen to the extremities (often the legs) is blocked, gangrene, or tissue death, can result. 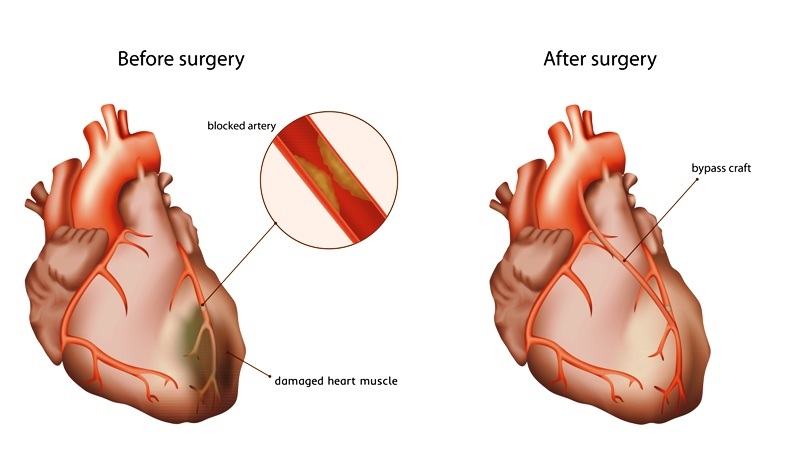 The image shows an illustration of bypass surgery to restore blood flow to the heart muscle by diverting the flow of blood around a section of a blocked artery in the heart. Coronary artery bypass grafting (CABG) is a type of surgery that improves blood flow to your heart. Surgeons use this technique to treat people who have severe coronary heart disease (CHD). CHD is a disease in which a waxy substance called plaque (plak) builds up inside the coronary arteries which causes symptoms such as angina. Angina is chest pain or discomfort that is caused when your heart muscle doesn't get enough oxygen-rich blood. It may feel like extreme pressure or someone squeezing in your chest. A patient can also experience discomfort or pain in shoulders, arms, neck, jaw, or back. The surgery allows diverting the flow of blood around a section of a blocked artery in the heart by adding a bypass graft.